Agwàtà: Beauty for the senses! Every once in a while, an event appears in a region's cultural landscape and makes a lasting impression, becoming dear to locals and visitors alike. Agwàtà is such an event. 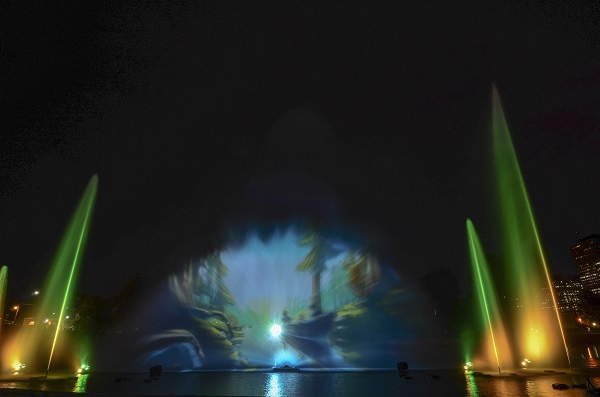 Back after a one-year hiatus, the multimedia production projected on a water screen will this year again dazzled crowds, leaving a mark on hearts and retinas, from July 21 to 30! "I heard about this! What kind of show is it?" Let's go through it quickly, because words are insufficient to truly describe the experience. In a nutshell, it tells the story of Hull, the central part of Gatineau. It starts with a tableau called "A ballet of fish", reminiscing on the lush nature that was abundant in these parts and that made the Anishinabegs people call them home a few millenia ago. Then come Philemon Wright and his crew, the region's development, industrialisation, and the changes the population underwent, ending with the Great Fire of 1900. 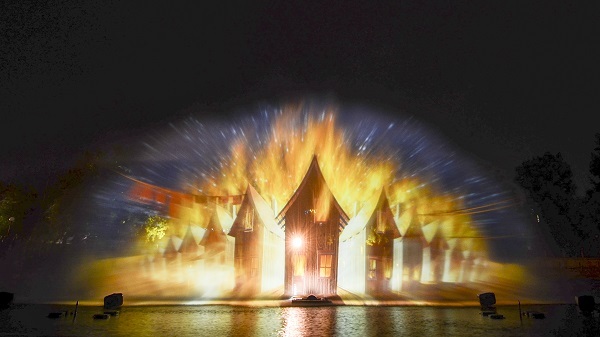 All this is projected on a water screen shooting directly from Brewery Creek (Agwàtà means "out of the water" in the algonquin language). It's quite spectacular, thank you very much! "There will be joy! But... where is it?" You know La filature on Hanson Street? The stands are just behind. The red line on the sidewalk will take you there. You can park for free at nearby La Fonderie or take the free STO shuttles that are on every week-end of the summer. And because it's right on the Culture Trail (the red line), there's plenty to do before or after the show! "OK I'm psyched! What now?" Well, for starters, you'll need tickets. Your ticket guarantees a place in the stands but it's first come first served for the seating. Tickets are $7 ($2 for those under 12) if you buy them ahead (at www.agwata.ca or at the Maison du tourisme, 103 Laurier St. in Gatineau), or $8 at the gates. There are two shows every night, at 9:30pm and 10:15pm. Tickets are going fast so get yours now! That's all there is to it! Now just sit back, put your brain in contemplation mode and enjoy! "My senses thank you already!" Wait until you've seen the show! We pretty sure they'll be thanking you for having them live this. Have a spectacular evening, magnificent person!